> Article first published in ? 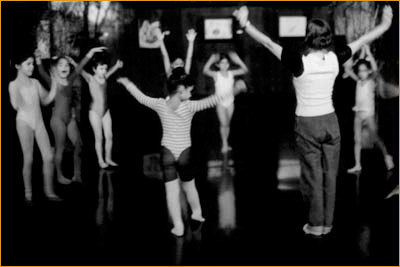 Two basic premises constitute the primary reasons that world dance forms are highly regarded as vehicles for teaching. The first is that many individuals believe that “dance is the international language,” a phrase widely trumpeted in such venues as international dance festivals and in the programs of folk dance companies. At the risk of making myself unpopular, I suggest that dance is no more international than German, Arabic, or Chinese. But in fact, like language, dance is culturally specific and, unless we intensively study a specific dance tradition, as we would study a language, we can have no more knowledge of a specific dance tradition and the society in which it is performed than the pertinent spoken or written language of a specific culture or society. The second widely held premise is that traditional dance is somehow the ancient and primordial form of cultural expression of a specific ethnic group and by learning and viewing it we can come to “understand” the culture. This thought, brought about largely in the eighteenth and nineteenth centuries during which the study of folklore was largely undertaken by scholars in their search for ethnic and national origins, is still a prevalent notion among many people today. But what of the dance traditions that we see taught in schools, community centers and other locations? Rather than being primordial, ancient cultural practices, the dances that immigrant and ethnic communities, as well as American folk dance teachers and recreational folk dancers, and amateur and professional folk dance companies perform, are often what Hobsbawm and Ranger have termed “invented traditions.” (1983). I will cite three examples, but, in fact, there are many more. The first example that I will utilize to illustrate my point is the jarabe tapatio, known in the United States as the “Mexican Hat Dance.” The jarabe is a well-known dance/music form in many parts of Mexico, but the term “tapatio” indicates a dance tradition from the state of Jalisco. Jarabe verses constituted a space of resistance during the Revolution. Decried by the church and state alike as immoral and subversive, and the accompanying dance as lascivious, the people seized upon the jarabe as representing them and their political aspirations. (Stevens 1952:183- 185. See also Sanchez Lopez and Correa Gonzalez 1998). The jarabe in its traditional form constituted a highly improvised choreographic tradition. The jarabe tapatio in its standardized form was first created by a Mexican choreographer, Felipa Lopez, in the early twentieth century to celebrate a government-sponsored fiesta that commemorated the successful end of the Mexican Revolution. According to Sanchez Lopez and Correa Gonzalez 1998, “some three hundred dancers danced it on the shores of Lake Chapultepec” (95-96). 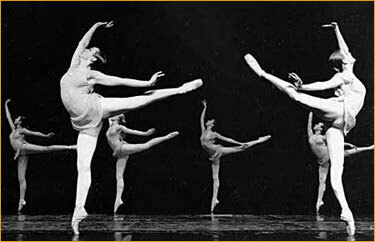 The dance was further popularized by Anna Pavlova who created a staged version in pointe shoes, and was showered with hats by her adoring Mexican audiences. In 1924, the Minister of Education Vasconcelos proclaimed the jarabe tapatio to be Mexico’s national dance and decreed that it would be taught throughout the Mexican public school system as a symbol of Mexican identity, designed to supersede any local dance traditions and bind together a diverse ethnic population. According to many informants who were educated in Mexico, the teaching of the jarabe tapatio is still commonplace. Thus, when Mexicans moved into the United States after the Mexican Revolution, the one dance tradition that they all shared through exposure in public schools was the jarabe tapatio. It was commonly performed in school and civic programs by school children. Throughout the twentieth century in North America, dancers who had learned this dance in the public schools were a constant feature of international folk dance festivals to represent “Mexico” in its most essentialized form. A second example that can be cited is the tinikling, the Philippine pole dance. In a manner similar to the official adoption of the jarabe tapatio in Mexico, this dance, through constant teaching of a standardized version in the public school system, became emblematic of Philippine American identity. Like the jarabe tapatio, I have observed this dance in public arenas such as international folk dance festivals and similar public occasions since the 1950s at least. Last year I witnessed a group of Philippine Americans perform this dance in an educational setting, and, as expected, they brought a group of children on the stage to attempt to dance between the clashing poles to the general merriment of the large audience of school children. A third example that I will cite are the so-called “pan-Hellenic” dances of Greece, which are in fact a group of five line dances that originated in the small area known as “Old Greece,” the region of contemporary Greece that first achieved independence from the Ottoman Empire and constituted the core around which the modern Greek state was formed in slow and painful increments. (Raftis 1987, 37). The government spread the teaching of this narrow repertoire through the public school system. Even the Evzones, the ceremonial palace guards of Athens, are expected to perform some of these dances on special state occasions. (Loutzaki 1994, 67). 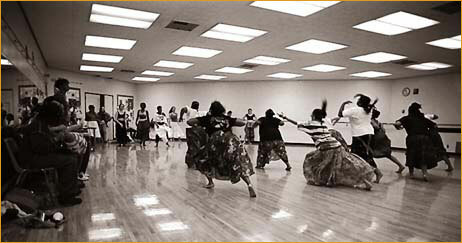 In all of these cases, the immigrant communities in North America perform these dances as an icon of ethnic identity in public forums such as international folk dance festivals held in many cities and towns. The jarabe and tinikling were performed almost exclusively as representational dances in occasions in which the ethnic community danced for others, while the so-called “pan-Hellenic” dances served the Greek community as both social and presentational vehicles. The reason for this was that the local regional folk dance traditions of the original homelands were largely unavailable to the immigrants because they came from so many different districts that often no critical mass of individuals from any single area existed to perform the music and dances from a specific area. Frequently individuals from specific regions told me that they no longer performed the dances they knew back home because there was no one else from their area who knew the dances. Thus, these standardized dance traditions, taught in public school systems served as vehicles of communal representation. Occasionally, enough people from a single region, such as Crete, came in sufficient numbers in a few locales in North America, in which very large Greek communities settled. The Cretans were able to form their own lodges, and there, away from the larger Greek community, they were able to carry out a specific local Cretan tradition whenever they gathered together in their own centers. Greeks from Anatolia (Turkey) would perform the tsiftetelli, a form of belly dancing, when they were away from the larger Greek community, which often disapproved of the tsiftetelli with its obvious Turkish and Islamic references. Adding to the distance from the original forms from which these invented and standardized traditions were appropriated, is the fact that for the past fifty years, these dance traditions have been viewed through the lens of the choreographic production of state folk dance ensembles such as Bayanihan of the Philippines, Ballet Folklorico de Mexico, and the Dora Stratou Greek Dances Theatre, which have all, to a greater or lesser degree, further spectacularized these dances. I have described and analyzed this phenomenon in my recent book, Choreographic Politics. (Shay 2002). In turn, the corresponding ethnic communities in North America, and elsewhere, have eagerly seized upon these spectacularized choreographies and show them in public venues as “authentic” examples of folk dance. I will only add that I regard all performances of dance as “authentic,” but there are different degrees of authenticity, which is why I coined the term “parallel traditions” to express this concept. The second issue I wish to address is: To what degree can our physical embodiment of folk, traditional, or world dance as these traditions are frequently labeled, inform us of other cultures and societies? What can we as teachers, students, performers, and choreographers learn about these societies through our own dancing bodies? At the risk of raising ire by pricking idealistic notions of the “international language of dance,” and hopefully, at the same time creating a discourse, I will venture to suggest: precious little. This is not to say that performing these dances is not an enjoyable, laudable experience that is totally devoid of all bodily knowledge or value. After all, I have performed, taught, learned and choreographed these dance traditions for a half century, and the performances of them with my own dancing body has served as a spur, a starting point, to learn more about a specific society and culture. Nevertheless, years of simply performing the movements of Croatian folk dances told me precious little about Croatia, the Croats, Croatian history, or Croatian society. For that I had to learn the language, read appropriate books, interview knowledgeable individuals, and live in the country. That having been said, I will cite an example from my own experience in which I did gain bodily knowledge. By performing, teaching, and choreographing Iranian solo improvised dance, the primary form of Iranian urban cultural production, two things about performing this dance with my physical body dawned on me. First, through the embodied performance of this tradition, I felt, but was unable to articulate for a long time, the geometric basis of this tradition, as well as the improvisational component. As time passed, and I lived in Iran and among Iranians and Iranian Americans, I at first sensed and felt, and later, through intensive bibliographic research, I was able to articulate the interconnectedness of this dance tradition with the highly geometric visual art forms such as architecture and architectural decoration, calligraphy, and Persian rug production on the one hand, and the highly improvised traditional performance arts of music and theatre on the other. Second, because I danced most frequently in Iranian and Iranian American environments, I quickly understood that, although I found this dance tradition visually and sensually captivating, Iranians themselves frequently held negative and ambiguous views of individuals who performed it in public venues, particularly if these performers were considered professional. I have coined the phrase “choreophobia” to describe these negative attitudes. In the beginning my Iranian friends were amused but faintly discouraging about my interest in their dance tradition and felt happier if I learned to recite poetry or perform vocal music. It took years of study, interviewing and analyzing these reactions, which most Iranians were often unable to articulate clearly, to understand how the historical formation of these attitudes occurred. (Shay 1999). One of the reasons that Iranians were unable to clearly state why they felt as they did, is because they were often very happy to perform this same tradition in social, celebratory occasions such as weddings. A similar situation of negative views occurs in the Arab world and Arab American community regarding belly dancing in which the dichotomy between the domestic form and the professional dancer clad in revealing costumes, which marks the dancer as a professional, demarcates more clearly the line between domestic and professional environments. Through my research, I had to probe issues surrounding the position of dance and the propriety of performing dance in Islamic societies. This intensive study of Islam and how Islamic jurisprudence functions, how dance can be frequently banned through fatwas, that is official pronouncements by Muslim clerics and scholars, and more generally, I became aware of the decision-making process in Islamic contexts. Thus, the knowledge of this process, the historical formation of Islamic attitudes and their relationship to pre-Islamic societal attitudes, gave me the knowledge of how earth-shaking events such as 9/11 came to pass. While my own embodiment of these dance traditions spurred my interest to research and analyze my first bodily impressions, it required me to learn the languages, and spend years of reading and interviewing in order to answer and articulate these bodily sensations. It has been a joyful, lifetime experience, one I eagerly embraced, and it all began with the body and the dance. Hobsbawm, Eric and Terrence Ranger, editors. Invention of Tradition. Cambridge: Cambridge University Press, 1983. Loutzaki, Irene. “Dance in ‘Political Rhythms;.” Proceedings. Study Group on Ethnochoreology. 17th Symposium, Nafplion, Greece, 2-10 July, 1992, 65-72. Raftis, Alkis. “Greece: Dance in Modern Greece.” International Encyclopedia of Dance. Volume 3, NY: Oxford University Press, 1998: 296-301. Sanchez Lopez, Javier and Armando Correa Gonzalez, editors. Antologia del Jarabe Mexicano. Aguascalientes: Impresion “Citlali.” 1998. Stevens, Robert. Music in Mexico: A Historical Survey. NY: Thomas Y. Crowell, 1952.